The Event is strictly an 18+ event. You may be asked to provide valid photo identification as proof that you are aged 18+ before you can enter the Event. The validity of photo identification will be determined by the Event Promoter or its authorised representatives at their complete discretion. If you do not have valid photo identification with you proving that you are aged 18+ you may be refused entry to the Event or may be evicted from the Event. You will not be eligible for a refund. Buying or selling tickets on third party websites (such as Trademe, eBay and Gumtree) is NOT permitted. 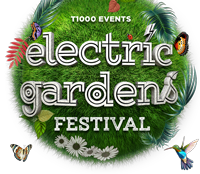 The official ticket resale partner for Electric Gardens Auckland is Tixel. If a ticket is bought, sold or offered for re-sale on any other third party website the Event Promoter may cancel the ticket without refund and you will be refused entry to the Event. The Event Promoter reserves the right for it or its authorised representatives to refuse entry to the Event to any ticket holder at their complete discretion. You acknowledge that the Event or individual performances may be cancelled, terminated early, relocated or rescheduled for various reasons beyond the control of the Event Promoter including, but not limited to, acts of God, adverse weather, natural disasters, industrial action, power supply issues, safety issues, technical issues, national emergencies or at the direction of authorities or the government. Event Security will be conducting thorough bag searches of every person as a condition of entry. This is non-negotiable. Additional searches may be conducted during the Event at the complete discretion of Event Security. If you refuse a bag search you may be refused entry to the Event or evicted from the Event. be denied entry to the Event or evicted from the Event. any other items which may cause injury or public nuisance or disrupt the enjoyment of others. If a Prohibited Item is confiscated from you, it will not be returned. Illegal substances, weapons or items considered dangerous or offensive will be handed over to the police. If you are denied entry to the Event or evicted from the Event for possessing a Prohibited Item you will not be eligible for a refund. If you are not sure whether something is a Prohibited Item you should leave it at home. The Event Promoter or its authorised representatives may evict you for any offensive, dangerous or illegal behaviour determined at their sole discretion. If you are evicted from the Event for offensive, dangerous or illegal behaviour you will not be eligible for a refund of your ticket. Alcohol not purchased at the event is a Prohibited Item. Service of alcohol at the event is conditional on you holding photo identification as proof that you are aged 18+. If you fail to provide photo identification upon request you will be refused service of any alcohol. If you are found to be supplying or buying alcohol for any person under the age of 18, you will be evicted from the Event and the matter may be referred to the police. No alcohol purchased at the Event is to be taken off-site. You will be refused service of alcohol if you appear intoxicated. All illegal drugs are a Prohibited Item and are not permitted at the Event. This is for your safety and it is also the law. The Event Promoter maintains a zero tolerance approach to illegal drugs and this will be strictly enforced without exception. Police will be notified of any incidents involving illegal drugs. Drug searches will be conducted at the entrance to the Event by the police. Sniffer dogs will also be patrolling the queues. As a condition of entry, you are consenting to your person being filmed and photographed. These images may be used by the Event Promoter for purposes including, but not limited to, promotional purposes without compensation to you. The Event Promoter, its related entities and authorised representatives will provide all services to you at the Event with due care and skill to the extent required by law. You enter this event at your own risk. Except as required by law, the Event Promoter, its related entities, and their respective directors, officers and authorised representatives assume no liability for any loss, injury or damage caused to you or your property during the Event or in anyway related to your attendance at the Event. To the full extent permitted by law, you waive all legal rights of action against and fully release the Event Promoter, its related entities, and their respective directors, officers and authorised representatives from any liability for any loss, injury or damage caused to you or your property during or in respect of the Event. You agree to indemnify the Event Promoter, its related entities, contractors and their respective directors, officers and authorised representatives against any loss, injury or damages caused to any other person or the property of any other person arising out of your actions, negligence or breach of these Terms and Conditions. the time and location of the Event. If any changes are made to the advertised program, ticket holders will not be elegible for a refund.